Well, I did it. I knitted two sculptures. I am still unsure about this new experiment of mine of knitting a sculpture but I submitted them anyway to an exhibition. I truly enjoyed the process, both the creative planning, thinking, dreaming, and the knitting. The first sculpture is the one I talked about on my previous post. I called it Cross Section: Great Salt Lake. Here is the finished piece with some information (or label for you museum geeks out there). Great Salt Lake’s shoreline is receding with the season becoming salty and white. The north arm of the lake is super saturated with salt where halorarchaea bacteria flourish. On the northern shores, the white is tinged with pink from the colorful bacteria. The north side became more salty when the Lucin Cutoff railroad causeway was built across the lake in the 1950s creating two distinct environments. The Great Salt Lake ecosystem is knitted together with its geography; change one thing, change everything. The second sculpture came about after one of my trips to the shore of the lake. I am always intrigued by what I find in the salt bed of the evaporating lake. I have been collecting odds and ends for years. 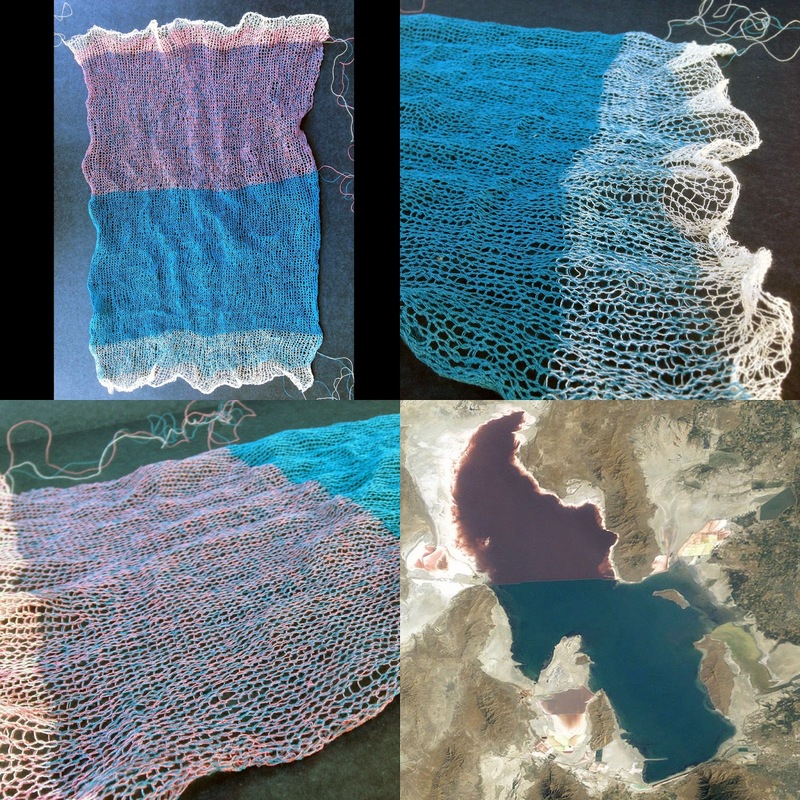 The salty lakebed is like a knitted fabric, knitting in the ecosystem and other flotsam with salt crystals instead of yarn. So, I created a small piece of the dry lake bed with bits that I collected from the lake shore over the years. I called it Dry Lake Bed: Great Salt Lake. Great Salt Lake is a terminal lake, the only way water leaves it is by evaporation, And because it is such a shallow lake–an average of 14 feet–about 2.6 billion gallons evaporate from the lake every day. Evaporation leaves minerals and salts behind making the lake one of the saltiest in the world. The salinity ranges from 5 to 27% (the world’s oceans average 3.5%). 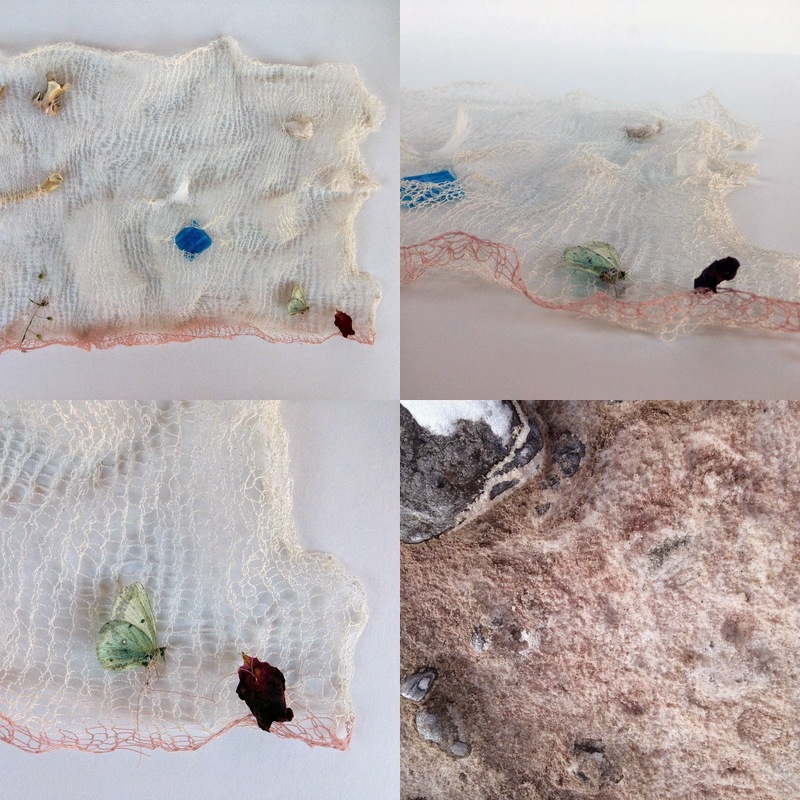 The rapidly evaporating shoreline traps animals, plants, bacteria, and objects in the salty crust; knitting the remains of an ecosystem within its crystals. Both of these are knit with silk/stainless steel yarn so they are slightly moldable. This helps with making them more three-dimensional. But the yarn memory is a little hard to fight against. I will find out in a week or so if either piece was accepted. They aren’t the traditional sculptures that come to mind, but you never know.